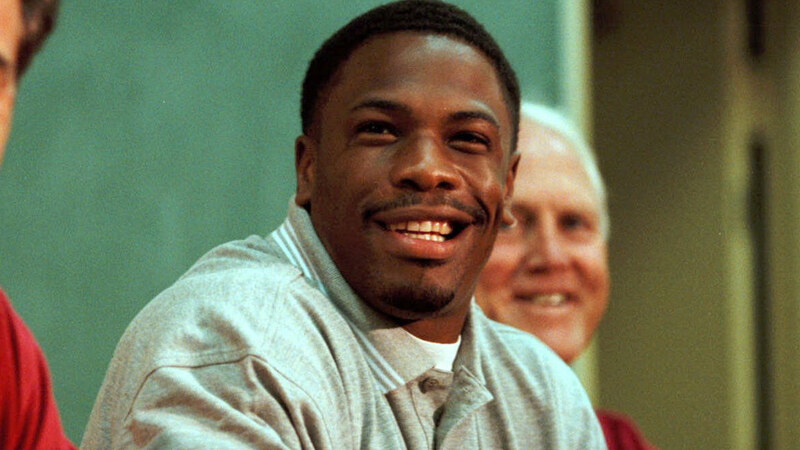 DELANO, Calif. -- Former NFL running back Lawrence Phillips was found dead in his cell at Kern Valley State Prison early Wednesday of a suspected suicide, the California Department of Corrections and Rehabilitation said. Guards conducting security checks found the 40-year-old unresponsive in his cell shortly after midnight. He was transported to an outside hospital where he was pronounced dead about an hour and a half later. Phillips was sent to prison in 2008 to serve a 31-year, four-month sentence after he was convicted of twice choking his girlfriend in 2005 in San Diego and of driving his car into three teens later that year after a pickup football game in Los Angeles. He was sentenced for inflicting great bodily injury involving domestic violence, corporal injury to a spouse, false imprisonment and vehicle theft. He had been housed alone in a segregation cell since April 2013 after he was suspected of killing his cellmate, 37-year-old Damien Soward. On Tuesday, a judge ruled that there was enough evidence to try Phillips in Soward's death. Phillips played for the St. Louis Rams, Miami Dolphins and San Francisco 49ers during a three-year NFL career. He was once one of the top U.S. college football players at Nebraska.